Despite intense IDF activity in the Gaza Strip, five Qassam rockets were fired Thursday afternoon and evening at the Sderot area. Two of the rockets landed in the town, while the rest landed in open fields outside Sderot. One of the Qassams was discovered near the Gevim junction and another one fell in a thicket nearby. Meanwhile, the fighting in Gaza continues: Palestinian sources reported that at least eight people, most of them gunmen, were killed Thursday afternoon by a direct hit of an IDF artillery shell in the Beit Lahiya and Jabalya area in the northern Gaza Strip. Another 20 people were injured in the strike, some sustained critical injuries. Two Palestinians armed with an antitank missile were identified in the afternoon in Beit Lahiya. A tank fired at their direction and they were killed. Another six Palestinian gunmen were killed since the operation was launched Wednesday night. IDF sources said that since early morning there have been several shooting incidents in the Strip, during which army forces, including the IAF, hit several gunmen. According to the officials, all the strikes were aimed at terrorists, and according to IDF data 20 Palestinian gunmen were killed in the Strip since operation "Summer Rains" was first launched after Gilad Shalit's kidnapping. Earlier, Palestinian sources in Gaza reported that and IAF helicopter fired a missile towards a group of people in Khan Younis. According to Palestinians, two Hamas gunmen were killed and a dozen Palestinians were wounded in the strike. The gunmen were later identified as Muhammad Suleiman a-Najar and Muhammad Abu Tir. 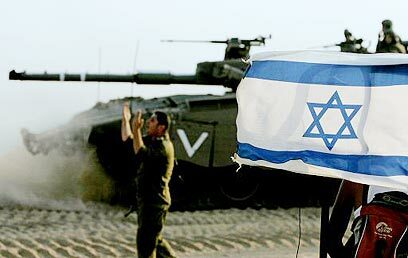 Golani Brigade troops under the command of Colonel Tamir Yadai, accompanied by tanks, Israel Air Force jets and artillery fire, reached the now-destroyed former Israeli settlements Dugit, Nisanit and Elei Sinai, from which Qassam fire toward Israel has emanated. Additional forces entered the Palestinian town of Beit Lahiya, also used by Qassam cells to fire rockets at Israel. Palestinian witnesses reported of heavy exchanges of fire in the area. According to reports, one Palestinian, later identified as Muhammad el-Atar, was killed in the clashes when a bullet struck his chest and came out of his back. “It’s a crazy scene – everyone is shooting at everyone,” a Beit Lahiya resident told Ynet. Meanwhile, the IDF’s activity in south Gaza continues, with forces operating in the Dahaniya area, where it is estimated that Gilad Shalit is being held. The operation in the southern Strip is being led by the Givati Brigade. Forces are also searching for underground tunnels and bombs near the Erez crossing. The operation, which was launched overnight, aims at halting Qassam fire and creating a security zone for Israeli communities near Gaza – and now also Ashkelon. Under the cover of air force warplanes, large IDF troops deployed on the ruins of former settlements which Israel destroyed after pulling settlers from Gaza. Defense Minister Amir Peretz said during an assessment meeting that “the deployment of IDF troops in north Gaza was inevitable. “The fact that we acted in a measured and gradual manner created the legitimacy for the operation,” he said. The Palestinian Authority has asked the international community to "stop this collective punishment". Prime Minister Ismail Haniyeh said: "IDF activity in Gaza and Israel's escalation are proof of Israel's failure and show Israel is facing a crisis. The operation and crimes expose Israel's concealed plan to reoccupy Gaza." Haniyeh called on the international community to respect the Palestinian people's election of Hamas and added: "No bombing, reoccupation, arrests of ministers and officials will defeat the Palestinian people." See all talkbacks "16 Palestinians killed in Gaza battles "